UNAVCO provided one field engineer to help instruct and field assist a three-week High Arctic Field Course lead by Ron Sletten (University of Washington) and Jeffrey Welker (University of Alaska, Anchorage). The course included twelve students from a variety of universities and of both biology and geology backgrounds, and at different stages of their academic careers. The course was staged in Thule, Greenland, with a six-day trip to nearby Green valley. One of the main goals of Ron and Jeff's continuing work in the high arctic is looking at carbon cycling by studying both the ecology and soil chemistry of arctic ecosystems. 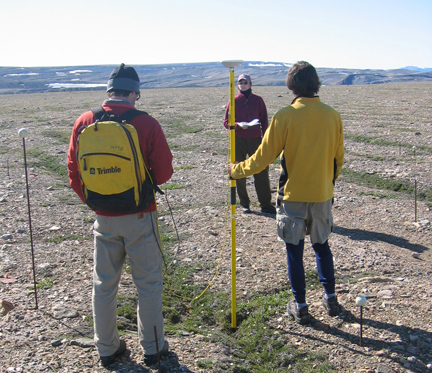 UNAVCO support was used to map out various permafrost features, including stripes and polygons, and to install and measure markers to determine downslope creep rates of these features and of solifluction lobes in Green valley. Rates of these processes are as of yet poorly constrained. This is the first year of UNAVCO involvement in this project.